The newest season of Beads, Baubles & Jewels is now available! Beads, Baubles & Jewels series 2700 features 13 episodes with ideas and inspiration for beaders and metalsmiths. From metal clay to fabrication, seed bead weaving to loomwork, wire wrapping to resin, it’s six hours of jewelry-making bliss. Our theme for this series is “A Sense of Place.” Learn how our surroundings influence design, whether exotic locales or right in our own backyard. Whether you‘re an armchair traveler or actually pack your bags, every place has its own colors, style, architecture, and materials. So many of your favorite beading instructors stop by the show to share their signature projects and techniques! Tammy Honaman, Sara Oehler, Brenda Schweder, Julie Sanford, Kate Richbourg, Tracy Gonzales, Lindsay Burke, Kim O’Neill, Leslie Rogalski, Robin Kramer, Nealay Patel, Candie Cooper, and Jill Wiseman all join us for this season of Beads, Baubles & Jewels. Our show is powered by a lot of caffeinated people! I recommend you make a fresh pot of French press coffee (affiliate link) and join us for a dose of jewelry-making inspiration. Metalsmith Julie Sanford joins us for a two-part lesson on the fundamentals of fabrication using found metal and wire. 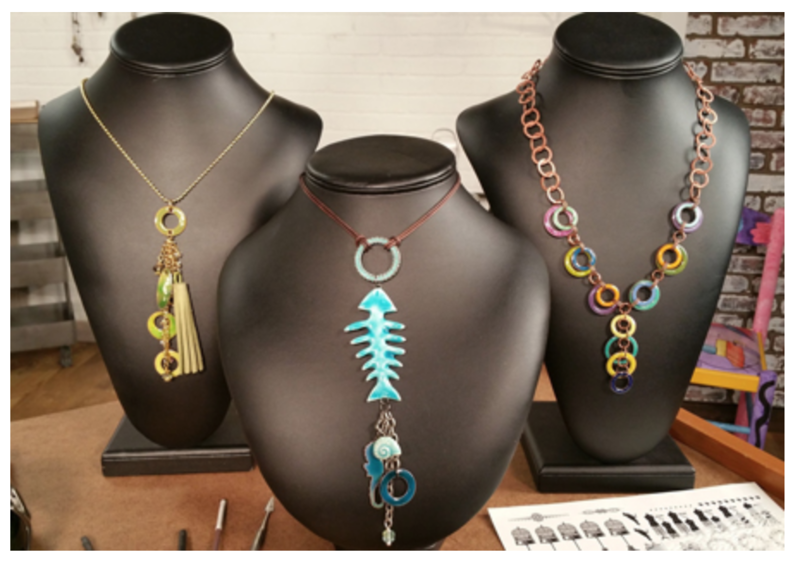 Julie shares great tips for where to find the right metal for repurposing into jewelry. Plus, she demonstrates how to clean it; prepare it for fabrication; and turn it into a beautiful wire bracelet. Get ready for some color! Tammy Honaman presents her top tips for enameling, inspired by her blog 15+ Enameling Tips: Safety and Basics for Bringing Color to Your Jewelry on episodes 11 and 12. She covers everything you need to know to try enameling for the first time and gives great tips for improving your current technique. We’re lucky to have Tammy presenting projects and techniques throughout the series. She shows us her favorite way to make metal clay lentil beads; using texturing hammers; making handmade chain from wire; creating wire wrapped beaded chain; stitching peyote with a twist; and looming with fiber and beads. Brenda Schweder, inventor of Now That’s a Jig, is a regular guest on Beads, Baubles & Jewels. 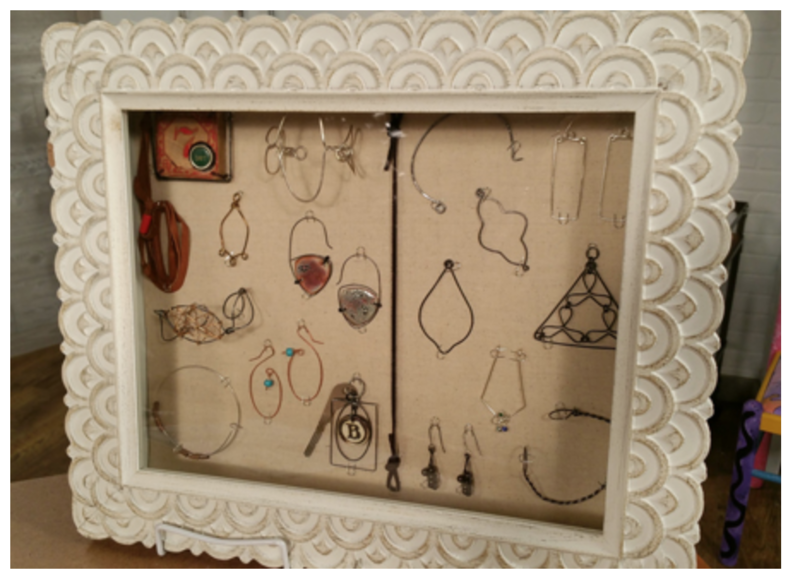 Many of her projects combine her art background with her love of wire. 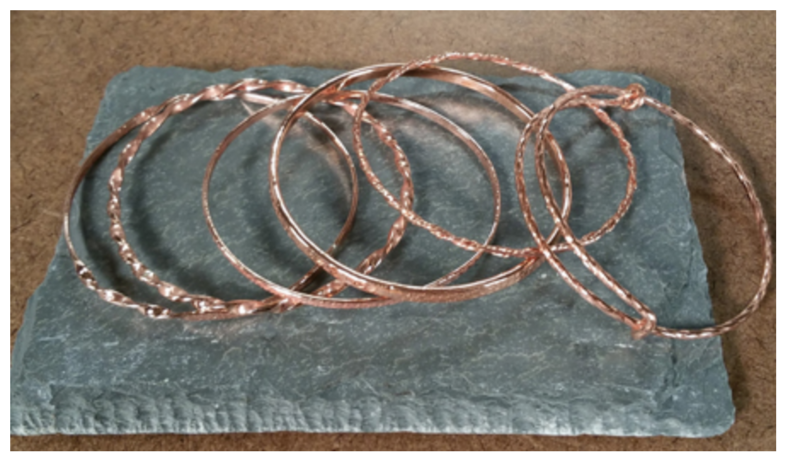 In this series, Brenda shows us how to make repeatable wire motifs and use them in a variety of ways. Making your own focal elements is a fantastic way to create jewelry that stands out from the crowd. Plus, the ability to wire-wrap identical components makes it easy to create a marketable jewelry collection. Brenda has built her business by networking, and Facebook Live has become a big part of her marketing plan. On episode 12, she shares tips for getting started filming your own videos or Live broadcasts. She’ll show you a good basic set-up, with lights, tech, and topics. If you want to boost your broadcasts or you’ve been thinking about starting Facebook Live shows, then this is an episode you don’t want to miss! 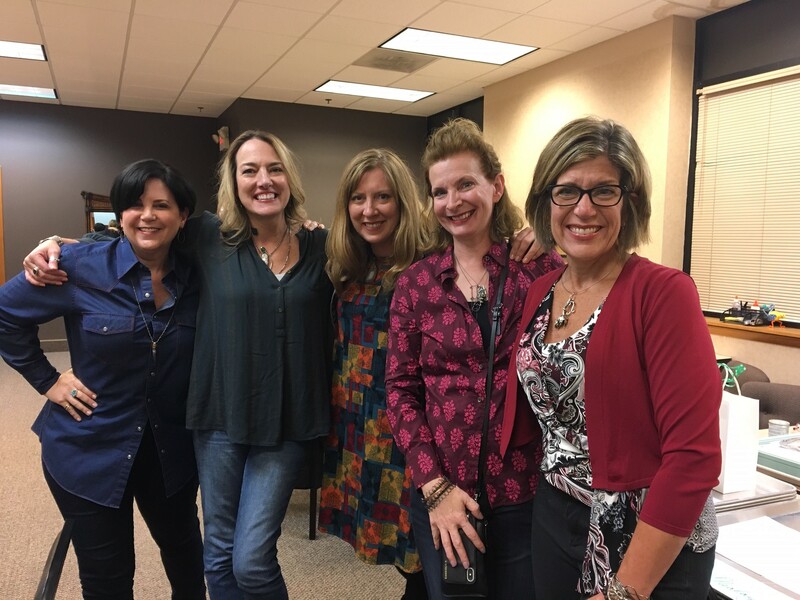 Robin Kramer, of Red Boot Consulting and Flourish & Thrive Academy, is a specialist in the business of jewelry. 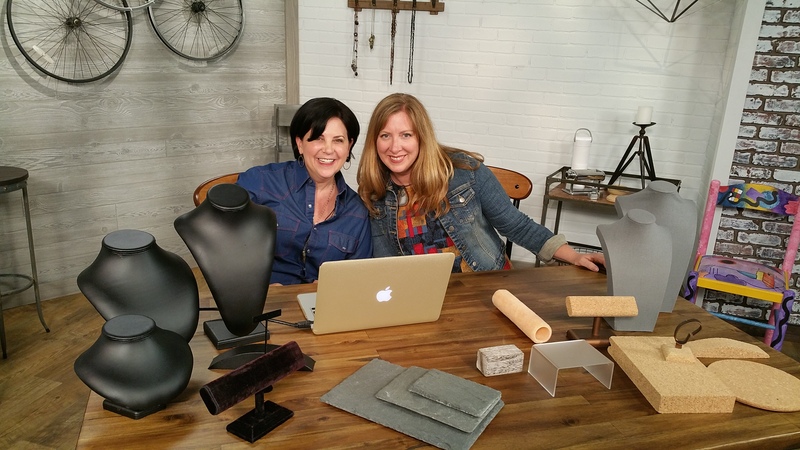 For her first appearance on the show, she brought great tips for creating your jewelry collection and making a display that reflects your brand. You’ll get important information about selling your jewelry, whether you’re doing online sales or in-person events. 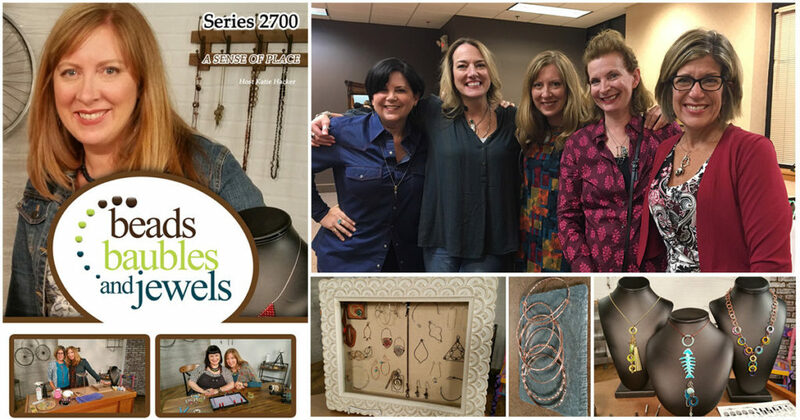 We had a lot of first-time guests on Beads, Baubles & Jewels series 2700. 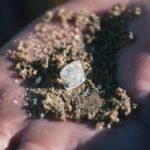 Sara Oehler wrote a fun behind-the-scenes blog post about her experience at SaraOehler.com. Tracy Gonzales from TierraCast shows how to customize pewter components to create a curved feather bracelet and Hamsa hand earrings with sari silk. And, Lindsay Burke from FusionBeads.com brings trendy jewelry designs to the show, including a project from her book, Make it Sparkle: 25 Dazzling Jewelry Designs to Make Any Occasion Special. Of course, some of our guests have been on the show many times. Tamara Honaman, Kate Richbourg, and Candie Cooper have appeared too many times to count! They always bring inventive ideas and interesting techniques. And, it has been a few years since Leslie Rogalski was a guest and it was great having her back on this series. It’s not easy to demonstrate teeny tiny seed beads on camera, but Leslie is a seasoned pro! A lot of viewers have told me that they watch Beads, Baubles & Jewels to relax. It makes me happy to know that you feel at home with us. Whether you binge-watch all 13 episodes or take them a little at a time, we’re bringing you all the guests and projects you want to see. There’s so much information and inspiration in Beads, Baubles & Jewels series 2700 – you’re going to love it! Treat yourself to a dose of jewelry-making inspiration!